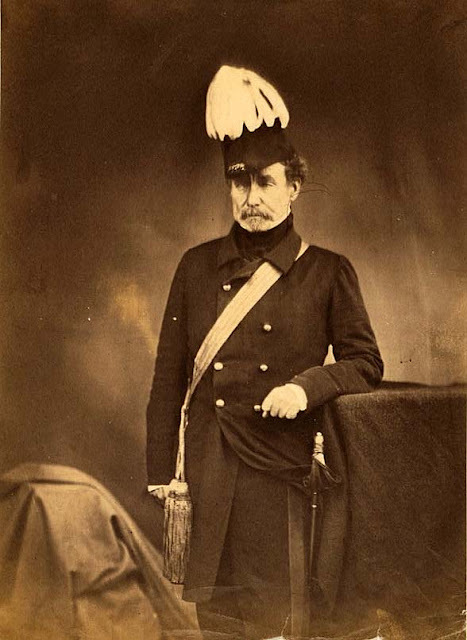 Lieutenant General Sir Colin Campbell (1792-1863), commander of the 'Thin Red Line' (Roger Fenton, 1855). The Thin Red Line is a term for a thinly spread military unit holding firm against attack. The phrase later took on the metaphorical meaning of the barrier which the relatively limited armed forces of a country present to potential attackers. The first use of the expression referred to the resistance by the red-coated 93rd Highland Regiment of the UK in the Crimean War. The Thin Red Line, painted by Robert Gibb. The Thin Red Line was a famous military action by the British Army's red-coated Highland Brigade, at the Battle of Balaclava on October 25, 1854. The brigade and its leader distinguished themselves very greatly: with his 'thin red line of Highlanders' he repulsed the Russian attack, and prevented the Russions from occupying Balaklava. Highlanders - what an enigma, burly guys in bearskin hats, beards, and... skirts. Uniforms were so much more dashing back then! US: "The Navy and Coast Guard were the last to ban beards. In January 1985 the Navy banned them. The Coast Guard banned them the next year in 1986. Same reason as the other services. You can't get a good gas mask seal over whiskers." UK: "Before 1939, British army troops were allowed, with permission from their commander, to grow a beard. Since then, the only soldier in the battalion allowed a beard was the combat engineer sergeant and colour sergeants who was allowed to keep a beard by tradition. In many British Commonwealth armies it is traditional that the Pioneer Sergeants attached to the infantry has a beard. This goes back to the days when they used to stick the slow burning fuze into their beards for safekeeping when assembling explosive charges."